Publisher: Sony. Developer: Insomniac Games. I’m loathed to criticise games that risk their neck trying something different. After all, the more cynical among us are often all too ready to brand a new entry in an increasingly-populous series such as Ratchet & Clank with that most dismissive of tags: “more of the same”. The frustrating thing is, All 4 One makes a genuine venture into uncharted platforming territory, but between its concept and execution, the end result sadly isn’t conducive to an enjoyable game. Platform heroes Ratchet and Clank are joined this time around by marvellously maniacal robot villain Nefarious and pea-brained walking-ego Qwark as the quartet team up for a cooperative adventure, as they wade through a hearty though admittedly completely unfathomable narrative that culminates in the group battling a massive mutation known as Mr Dinkles. 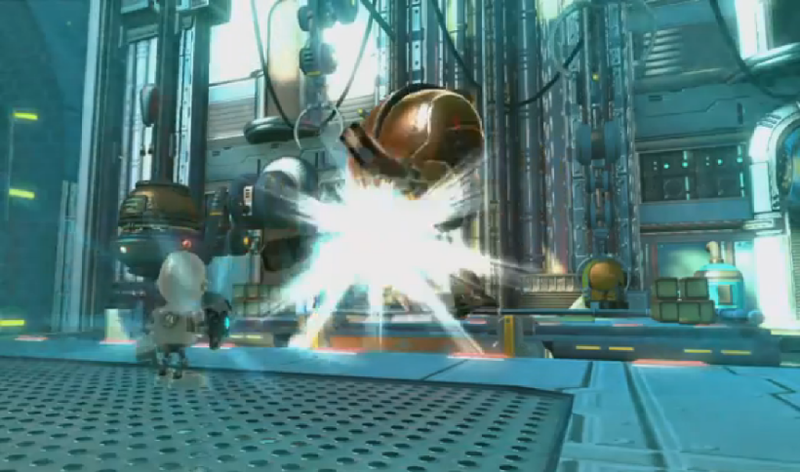 At least two characters are active in the field of play at all times, with the player accompanied by either a computer-controlled ally, friend/s, or allies met online. All 4 One at first glance appears an ideal adventuring companion, possessing that oh-so-rare combination of good looks and an infectious sense of humour. The familiarity of the cartoon sci-fi landscapes barely diminishes the visual splendour however as we’re treated to some considerable scale and ambition, with some reassuringly gargantuan bosses and a bright, attractive veneer that’s always cheery though never garish. Its tongue-in-cheek humour rarely misses a beat, and All 4 One, despite a story that carries about as much weight as candyfloss, proves nicely scripted, regularly drawing a chuckle. Later, Clank is encouraged to pick on robots "his own size"
The problem is, when it comes to the meat ‘n’ potatoes gameplay, everything’s spread too thinly. 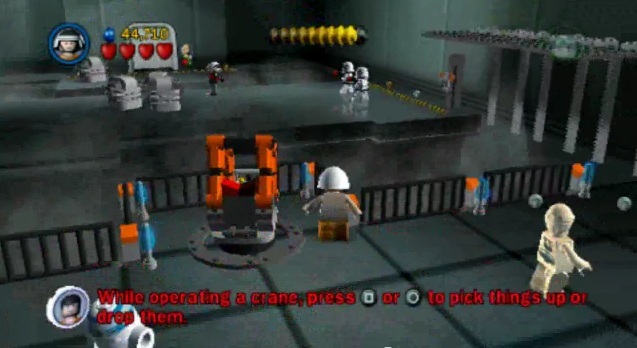 Whilst the game regularly encourages cooperation, too many of these instances feel mundane, as if they’ve been plonked into a standard platformer to justify a new tack, with activating switches or launch pads, zapping boxes or attaching to one another to swing from ropes among the main offenders. Occasionally towards the end, things venture some more creative ideas, such as a cool little section that sees players deflecting beams off of their Reflector shields in order to draw their focus on to otherwise-protected targets, whilst working as a team always makes the tougher combat sections more manageable. The single-player is simply dull, as you’re soon made very aware that every level is overly-spacious and drawn-out, with what should be a few minutes of platforming often spilling over in to twenty minutes or more of trekking, and there’s too much aimless wondering and crate-smashing. It controls solidly enough although your platforming nous is only intermittently put to the test, whilst the A.I. is generally okay if a little prone to suicidal decisions. The player is punished for going it alone, with the experience undermined by petty penalties, mostly notably a considerable reduction in the number of ‘bolts’ rewarded for progression. Elsewhere, naming the one-player campaign as ‘Offline’, along with the ‘Create Game’ menu prompt, serves as an irksome reminder that, in this most single-player orientated of genres, it really doesn’t want you playing alone. Still, though it’s a little more fun and a little less dull with company, the online component rarely feels an ideal fit either. Bizarrely for a setup that should thrive on quick turnovers and a concerted focus on gameplay, it’s hampered by a slew of lengthy cinematics, which soon become tiresome, particularly if you’re replaying sections of the story. Furthermore, if players join whilst a game is in progress, the action must reset to the last checkpoint to allow them to appear, regularly robbing existing players of thousands of bolts acquired in the meantime. Most of the weapons are a bit forgettable in truth, but a few make up for the majority. 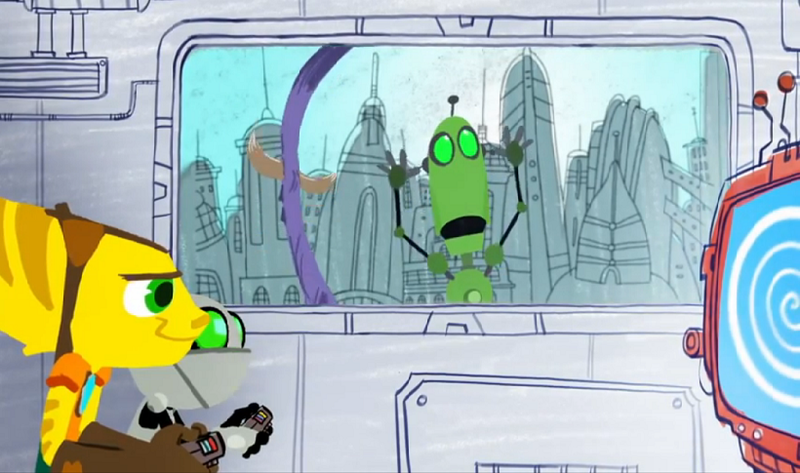 Mr Zurkon, a small robot deployed to assist your crew in battle, is back and on-song once more with his memorable array of (mostly withering) proclamations, including “Mr Zurkon doesn't need bolts; his currency is pain” and, upon being spawned by Galactic President Qwark “Mr. Zurkon did not vote for you”. Elsewhere, the undoubted highlight is the Critter Strike, a laser beam that, with sufficient focus, turns foes in to big, bright pigs. Enough said. Lightweight as a shoot ‘em up, protracted as a platformer, and hit ‘n’ miss as a communal experience, All 4 One has its moments but ultimately leaves you wanting more. There are a lot of levels and a slew of isolated highlights, but the game’s bloated design puts a strain on the player’s interest. Things belatedly start to pick up again in the final few stages, but most will be left with the impression of an adventure that was ‘long’ rather than ‘epic’. Tuning-up weapons is neat and fighting the bosses remains a pleasure, but when it comes to co-operative hijinks, it lacks the fun-factor of the LEGO titles, and for all its endeavours, All 4 One feels anaemic next to its trio of PS3 predecessors.